There is good news and bad news for Barack Obama in Ohio. -His lead in the state is down from seven points in a PPP survey a week and a half ago to now just two. -He is losing ground among white voters. Last week he trailed just 49-46. Now it's 55-43. -Undecided independents seem to be moving in McCain's direction. Last week Obama was up 48-36 with that group, now it's 49-46. -Even though Obama's margin has gone down a good bit, his actual standing is pretty much the same as last week. There is little fundamental difference between 50% and 51%. -He's banked a huge lead with early voters, who made up about 30% of the sample. He's up 65-34 with those folks. McCain's tightening the race to two points is predicated on his winning election day voters 54-44. -Democrats don't need Ohio to win this year. In 2004 John Kerry's path to the White House pretty much had to go through Ohio. Obama would sure like to win the state, but it isn't a deal breaker for him the way it was for the Democrats last time. In Ohio's race for Attorney General Democrat Richard Cordray leads 50-38. Well, excellent point about the early voting. I suspect the final margin in this state will be a bit larger than 2%, and I think Obama will win, regardless. That 50% Obama number is pretty critical. I'm from Ohio and have always thought Obama would lose here. However, I find it hard to believe election day turnout will favor McCain by 10 points. Oh well, I never thought we'd take OH anyway. With numbers this close, I'm glad the Sec of State & Gov are Dems. McCain is up by 10 among 70% of the respondents? I wonder whether many of these late breaking undecideds will show up. Come on they waited until a day before the election to finally conclude who to vote for? Most of them I suspect just will not vote. Too bad no question was posed that may be reflective of enthusiasm gap (or lack thereof). The thing is, that early voting margin does more than simply build in an Obama lead (over a time period in which Obama was farther ahead in some polls of OH). It also potentially demonstrates a real enthusiasm gap between Obama and McCain supporters. Obama spent the entire day campaigning across Ohio and a total of 200k people showed up for rallies. Every poll still has Obama leading here, so I think he'll take it even though it's gonna be close. Well, Obama at 50% and up by 2 with essentially a day left is better for him then the other way around. Why didn't you have Roberts Owens (I) as an option for Attorney General? That's who I voted for (the only non-Democrat in fact). I imagine that's why that race has so many more undecided's. Notice something else? Of all the polls, national and state (well, the battleground states, anyway) by reliable pollsters, McCain hasn't led in almost any of them. 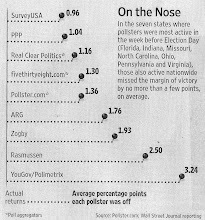 Mason-Dixon's OH, FL and NC polls are the sole exception. Oops! Meant Missouri, not Florida. All of those leads in the M-D polls are very slight, regardless. North Carolina, Florida, Indiana, Missouri, Montana and Georgia are left right? Given Obama is ahead by just 2 in Ohio, I have a bad feeling about the remaining polls. SUSA typically offers crosstabs by income level, and I've noticed that they seem to consistently be undersampling low-income voters (compared both to the median state income and 2004 exit polls.) Obviously, it will probably be more difficult to survey them, as they may not have landlines or even a permanent address. Do you try to account for this problem at all in your surveys? The Columbia Dispatch poll that came out today has accurately predicted the presidential winner in every election in their lengthy history as a newspaper. I hope that is so. It's done by mail with 10 thousand or so sent out. Here is what you have to ask yourself as to the final result: The 65-34 margin with 30% of the vote means that McLame would have to win on election day by 57-43 with the remaining 70% to get to 50.1% of the vote overall. With all the national trackers showing a big spread and considering that Obama spoke to at least 175K on a football sunday in OH, does anyone really think McLame wins by 14% on election day. I think that is a very tall order. Male/Female breakdown in 2004 according to the exit polls was 53/47 in Ohio. Like Anonymous said, it's probably just a rounding issue. the difference between a narrow victory and blowout is going to be who has the better gotv effort. We can assume Obama's is very good. but can McCain match it? if so, I don't expect a electoral landslide. If Obama's ground game is much better, he will win Ohio. If Obama underestimated something and McCain ekes out narrow victories, then there's some obvious polling error across the board. All I'm worried about is polling error. Otherwise, I feel confident Obama is going to win assuming the polls are accurate. Everyone really shouldn't draw too much into the early vote stats. Obama's perceived early vote lead is mostly built up in urban counties like Cuyahoga, which went for Kerry 66-34 in 2004. More enthusiastic supporters means more early voters, but wait for some of those suburban and rural counties to come in for McCain well over 60% on Tuesday. Actually, if you are correct about these numbers in Ohio McCain needs a 57%-43% break on the day of Election to win. The 54%-44% difference gets you to that 2 point win by Obama. That would not be enough. According to the poll 30% of the respondents say they have voted. So that's presumably 10% M and 20% Obama with 70% remaining. McCain would need another 40% to win. Obama would need a little more than 30% to cross the 50% threshhold. Gonna be very tough for McCain. Of course maybe people are inflating their early voting actions. Have 30% of the registered voters actually voted? Here is the problem for McCain in OH. If PPPs results are right and McCain's source of strength lies in yet to vote likely voters, then for him to captialize on that untapped potential requires a serious GOTV effort, one that McCain does not have (he cannilbalized his GOTV for a few more tv ads). This problem makes it more likely that the final result in OH will be better for Obama than PPPs poll prsently shows. HAHA anyone believing a PPP poll in Ohio is right needs a wake up call. PPP was the crazy ones that released a poll that gave the Dems a 25 point party id edge in Ohio back in June, that is a 22 point shift in 2 years. HAHAHAHA Are you KIDDING me!??!?! You lost all credibility PPP when you released that poll, therefore I don't buy anything your polls say.